The combination of weakened muscles due to lack of bio-available calcium and fluid build-up along the joints (see blog on “Feeding Kibble to my Dog is always Cheaper). …these two things, together with environmental issues (to be discussed below), contribute to a proliferation of dogs with eventual (sometimes very early!) arthritis and hind end paralysis. 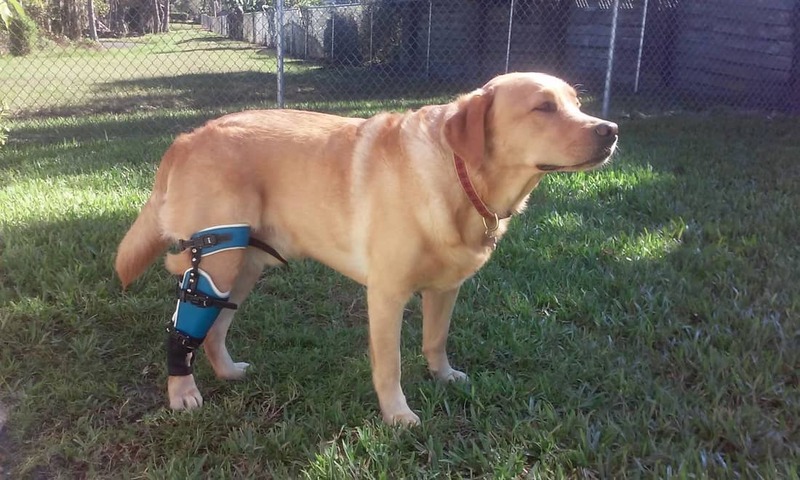 And, these dogs are also more prone to tear the ACL, which is a ligament that crosses the knee and holds it together protecting the meniscus and allows your dog to walk normally. If the muscles surrounding the knee, though, are weak, they can’t support the dog’s weight. In addition, a little muscle called the poplitius muscle is weak as well and can give your dog the appearance of either walking on tiptoe or hunching their back end. And while you’ve been feeding an expensive “popular” kibble and you have put yourself in a situation where you chose to save money on dog food in the short-term, yet you paid–dearly–and monetarily–ending up in surgery to repair and ACL by not starting your dog on a species-appropriate raw, paleo diet. ACL TEARS ARE NOT GENETIC– it’s hard to say “the reason your dog made that sudden move (juked when then he should have jived) is genetic” just sounds ludicrous. And age does NOT matter. (ask any veterinarian–ACL injuries are no respector or breed nor age) Nor is there any genetic marker to determine dogs predisposed to it-so there is no “health clearance” a breeder can do for this. The only way you can prevent them is to put your dog in a closed caged area—we know THAT ain’t happenin’! But read on to find out what things CAN make a dog predispositioned to ACL tears. But sometimes you have the surgery and your pet seems to be doing well, until, 6 months later and he tears another ACL (cha-ching $$$$—again!) You think about calling the breeder and reaming them out for producing dogs that are “hereditarily” prone to ACL…then they ask you, “When did you spay or neuter your pet?” See article here on how early spay/neuter increases your dog’s propensity to have ACL tears. You are defensive because your uninformed/uneducated vet guilted you into doing a spay or neuter before the breeder recommended, and your neighbor who is an animal rights activists tells you how you (a responsible dog owner) are going let your dog wander and produce unwanted pups. Don’t do it. Read this article and study the research yourself. Trust me, it may well be the best favor you’ve ever done for your pet. Lets put this to rest once and for all. Three things contribute to ACL tear: improper nutrition, early spay/neuter, and last of all, over-exercise. See blog on over-exercise here. This blog explains what over-exercise means and what it is, and how to avoid it, especially in the first 24 months of your pet’s life. My hope in sharing this blog is in hopes that the general pet-owning public, breeders, and veterinarians look at the research and science and stop allowing our pets to suffer the pain and agony of ACL tears. In my experience of selling my pups to veterinarians over the past 30 years is usually a phone call or email at some point in which they tell me they have applied all of this information into their practices and are now seeing their clients and pets thrive. I have a healthy male English Labradors who was not neutered until 15 months (I waited) he was on a raw diet as well as a good kibble he tore the first ACL in his puppy kindergarten class we had the tplo surgery by an orthopedic and the university of Minnesota with knowing there was a possibility of the other knee now norman is 3 and has both knees repaired. He is on high dose of omega 3 oil and a metabolism and joint care food. These surgeries though high dollar have been very successful! I recommend always conservative exercise and swimming is non weight bearing and very good for weight maintenance. Both meniscus are in tact and we were able to keep those. Keeping the weight low is the key which we know our friends love food!! Always STAY AWAY from steroid treatment and only use NSAID’S. If you can afford it also pay the extra money and have a scope exam and deriding to clean any remaining scar tissue and the torn ligament so saving the meniscus is the goal!